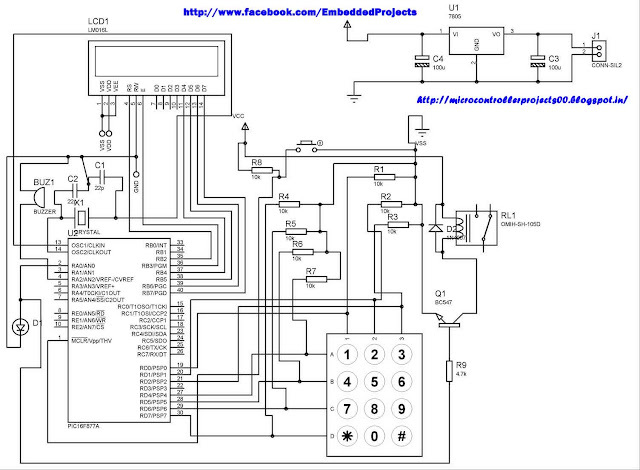 The system is fully controlled by the 8 bit microcontroller 16F877A which has a 8Kbytes of ROM for the program memory. 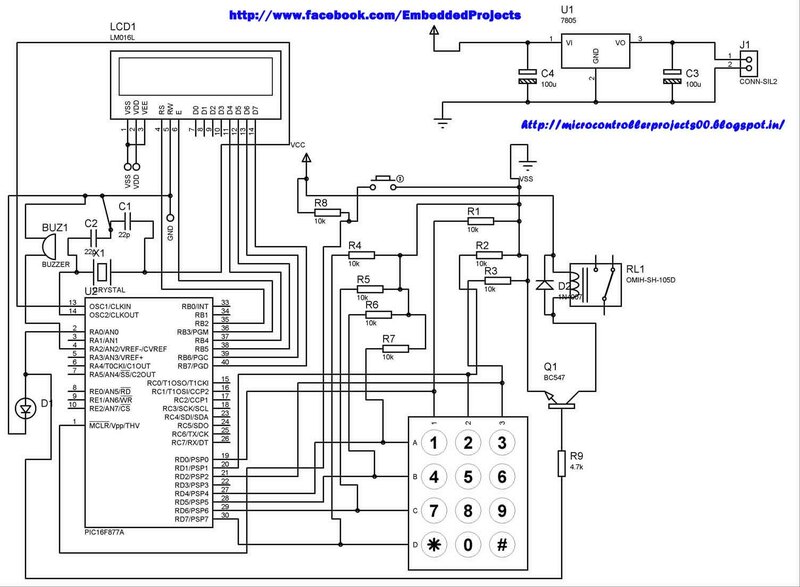 The password is stored in the EPROM so that we can change it at any time. The system has a Keypad by which the password can be entered through it. When the entered password equals with the password stored in the memory then the relay gets on and so that the door is opened. The code is built in a modular style to allow a user to find ways to modify project. In start the D Lock programs loads with a default code of "2345" format is *2345# which can be enter to unlock the door, the code cam be change by entering the master code in the format *23455#new 4 digit code. In this program i only display the result on LCD and lock will be placed at PORTA bit 0 where i put led for simulation. A 4x3 matrix keypad and a 16x2 LCD have been used here. Keypad and LCD are very commonly used input & output devices, respectively. 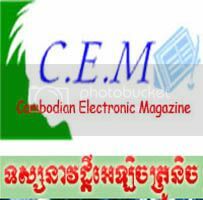 The password is stored in the system EEPROM. While unlocking, if the entered password from keypad matches with the stored password, then the lock opens and a message is displayed on LCD. 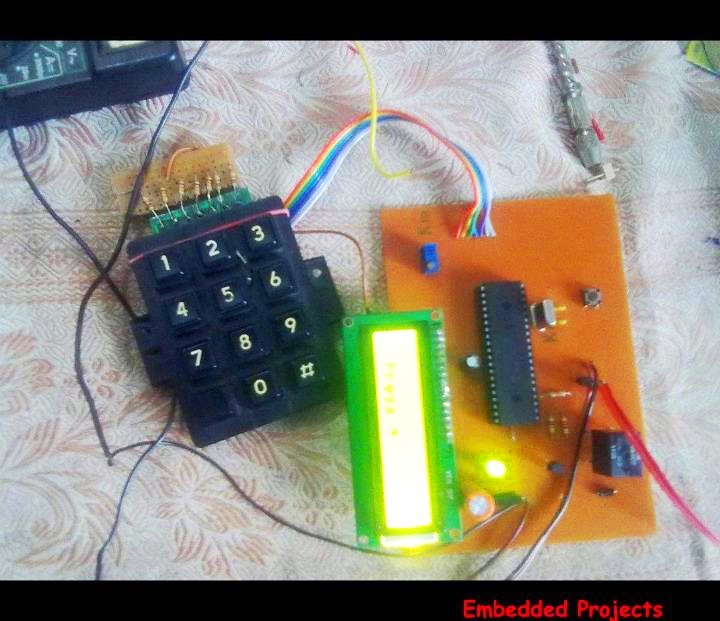 Also an output pin is made high to be used for further purpose..
As the program starts, wait for 5sec and press * string ‘Enter Password’ is displayed on LCD. The keypad is scanned for pressed digits one by one. Every time, row and column of the key pressed is detected and is displayed on LCD. After the four digits are entered, the user should press # to Confirm Password and again the input is taken through LCD. If the passwords do not match, a message is displayed to indicate ‘Access Denied’ otherwise the ‘Access Granted’ message. The default password is 2345 and master key to change password is 23455., entry begins with * and stops with #.